Introduction Adolescent HPV vaccination rates lag behind other vaccinations, partly due to missed opportunities for vaccination and lack of provider recommendation. This study evaluated the rates of HPV vaccination among adolescents with physical and mental limitation and controls, and evaluated differences in parental knowledge and reasons for nonvaccination between groups. Materials and Methods A retrospective chart review was performed on female patients age 12-18 presenting to pediatric or gynecology clinics in 2012. Those subjects with a diagnosis of mental or physical limitation were classified as “affected”. HPV vaccination rates were compared between affected and control groups. Parents of affected subjects were contacted by phone and surveyed regarding HPV knowledge and reasons for nonvaccination. Parents of controls were contacted at a 2:1 ratio and administered the same survey. Results 1673 females were included in the study; 72 (4.3%) with mental/physical impairment (affected). Overall, 944 (56.4%) subjects had initiated HPV vaccination and 653 (39%) had completed the three dose series. When comparing affected subjects to controls, the control group was more likely to have received any HPV vaccination (RR 1.32, 95% CI 1.013, 1.73). Parents of 21 affected subjects and 44 control subjects were contacted by phone. No differences were found in parent knowledge of HPV or importance of vaccination to a child’s health. There were no differences in reasons for nonvaccination between groups, but for both groups “lack of provider recommendation” was in the top two choices. That the vaccine was “not needed” was the other main reason given for nonvaccination in the affected group, while the control group main reason for nonvaccination was “concerns for safety”. Discussion Adolescents with mental or physical limitation may be less likely to receive HPV vaccination. Lack of provider recommendation remains one of the primary reasons those in this population do not receive HPV vaccination. 13. Stokley S, Jeyarajah J, Yankey D, Cano M, Gee J, Roark J, et al. Human papillomavirus vaccination coverage among adolescents, 2007-2013, and postlicensure vaccine safety monitoring, 2006-2014--United States. MMWR Morbidity and mortality weekly report. 2014 Jul 25;63(29):620-4. 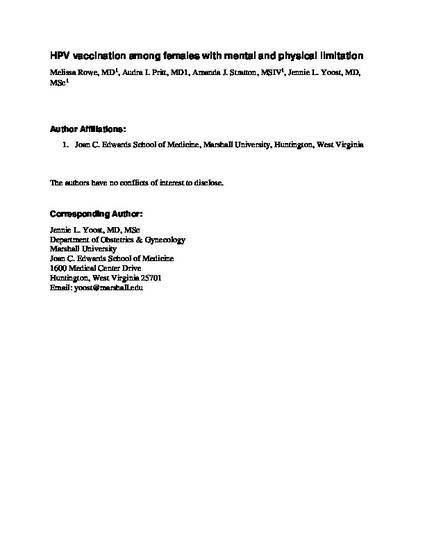 PubMed PMID: 25055185.